Citation: Shim D, Altmann J. How Marginally Does Impulse Buying Intention Change in Social Commerce? Nonparametric Regression Approach. Global Media Journal. 2016, 14:27. In this article, we provide a model that captures the decision making process of impulse buying in social commerce (i.e., on online daily deal websites based on social media) and that does not require any parametric assumption on model specification. Especially, we address the change of marginal impact of marketing stimuli and consumer interaction on impulse buying intension in the context of social commerce. 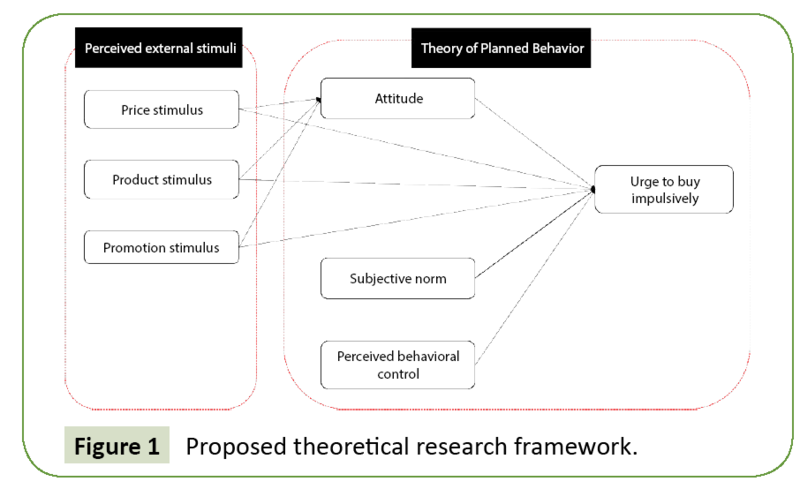 The theoretical framework was guided by the Theory of Planned Behavior (TPB) model. For empirical analysis, the nonparametric regression methodology was applied which allows to capture change of marginal impact without any parametric assumption; Multivariate Adaptive Regression Splines (MARS). Survey data was collected using a web-based survey system from 500 consumers, who had experienced buying coupons in social commerce. Our study finds that perceived price discount is a key behavioral antecedent for the urge to buy impulsively in social commerce and that its impact is not linear but nonlinear. The contribution of findings of this research is to show how impulse buying intention change with respect to consumer-environment interaction, which has not been addressed thus far in existing research. The rapid growth of social media service is a common phenomenon across countries. Especially, the rise in popularity of social networking services like Twitter and Facebook have given birth to new business models . Distributors, local manufacturers, and online portals make moves to interact with their customers online and sell their products and services by taking advantages of social media services. In this wave, electronic commerce has even been experiencing a new way of selling products. Purchase decisions are influenced by the collective social intelligence of people’s online interaction . Through social media service, people encourage their friends and family to enjoy together exciting new service or interesting products they found online. This new type of business model, which is called social commerce, uses social media services for, enabling social interaction in the purchasing process of new products . These distinct characteristics of social commerce made this business model to grow expeditiously. Social commerce brought four new features to the e-commerce scene . First, it offers significant discount prices as part of the business model, sometimes up to 90%. This allows highly risk-averse consumers to try new stores. Second, it provides promotions within certain time limits (e.g., one day) and at limited quantities. The time limit and quantity limit lead to a sense of urgency for buyers. Third, social commerce sites provide location-based services or products. This allows small businesses in local markets to experience advertising effects and sales growth. Lastly, social commerce causes visitors to encourage their friends or family via social networking services to purchase products . These characteristics of social commerce, unlike other forms of group purchasing e-commerce, attract consumers who are constantly in fear of missing the opportunity to purchase an inexpensive product or service. Exposing customers to locally available products for a limited time at limited quantity with a relatively huge discount stimulates their buying impulsiveness along with their desire to clinch a deal. Therefore, it can easily be observed that people purchase products or services impulsively in social commerce. Most of all, although there is no theoretical background that support consumer’s impulse buying intention changes constantly with respect to antecedents variables, vast majority of extant works mainly assumed constant marginal impact [7,8]. Rather, theoretical and empirical evidences in favor of nonlinear functions of consumer behavior have been suggested. For example, a couple of studies have been developed with empirical analysis of nonlinear change of consumer’s behavior  have shown the existence of an effective range of price discounts, in which consumers are sensitive to price change  reported a similar non-linear effect for price changes. These empirical studies imply that the impact of external stimuli on behavioral change is not constant but marginally changed as the level of stimuli increases. Therefore, the objective of this study aims at investigating unbiased marginal impact of consumer-environment interaction on impulse buying in social commerce and graphically show marginal response change of impulse buying intention. In detail, our three research questions are: (1) What stimuli and consumer’s cognitive and affective factors are significant when consumers feel urge to buy impulsively in social commerce? (2) Is the impact of such external and internal factors constant or non-constant? (3) If non-constant impact found (that is, the impact changes marginally), how does it influence impulse buying intention? In order to answer these research questions, first, we postulate the theoretical model that describes the process of buyers’ impulse buying decision making in social commerce. Guided by the Theory of Planned Behavior (TPB), we design the process of consumers’ impulse buying decisions. Second, based on this theoretical model, we construct and estimate a set of nonparametric regression models. In this part, in order to avoid prevailing presumption on linear relationships, we apply a more flexible nonparametric method, namely the multivariate adaptive regression splines (MARS) method. This method allows us to find flexible functional relationships between the independent variables and the response variable. Third, based on the estimation results, we conduct monte carol simulations. The aim of the simulation part is to graphically show the marginal response function with respect to consumers’ urge to buy impulsively. Through simulations, we eventually identify how the impulse buying intention changes as the level of perceived marketing stimulus and consumers’ internal decision making factors changes. We believe the findings of this study suggest a theoretical advancement in the understanding of consumer behavior in social commerce. The findings should be of interest to both academia and industry. From an academic perspective, this study provides additional evidence that consumer response is not linear, especially with regard to impulse buying decision making in social commerce. Not only finding significant factors that influence impulse buying behavior are important research questions in e-commerce era but also understanding change of marginal impact of significant predictors are. Given that most studies have been silent on capturing this impact in the e-commerce context, this study theoretically makes progress in helping understanding consumer behavior in the social commerce. From a managerial perspective, the findings may be used to guide marketers in selecting more effective marketing strategies to attract social commerce consumers. In particular, social commerce marketers face the challenge of designing products and services on their websites that are useful, valuable, and enjoyable. By better understanding how motivational factors impact the consumers’ attitudes toward impulse buying, marketers can obtain detailed insight for planning their social commerce strategies. The remainder of the paper is structured as follows. In Section 2, we describe the working process of the social commerce market and relevant issues. We also review previous literature on cause and effect of consumer impulse buying behavior. Section 3 describes our research model and the methodology used. In Section 4, we show the estimation results and point out interesting results obtained from the regression. Furthermore, using simulation, we show the change of impulsive buying intention with respect to change of marketing stimulus and consumers’ cognitive and affective states graphically. Finally, in Section 5, we discuss the theoretical and practical implications as well as the limitations of the paper. 1. Customers check frequently their e-mail, Facebook, or web sites for deals for goods and services from local sellers. 2. Customers share the deals they found and share them with their group of friends and family, encouraging them to make a purchase in order to meet the local seller’s requirement of a minimum number of buyers within a given time limit. 3. Customers, who successfully fulfilled the requirements, bring their coupons to the local seller and receive the discounted good or service. The innovativeness of social commerce business model is that, by combining location-based services and group purchasing mechanisms, it attracts consumers and makes them buy products and services at low price without prior inspections. Along with the popularity of social commerce, some social commerce companies have been showing remarkable growth. Since Groupon Inc. began its business in November 2008, it has experienced great success. According to the market report, Groupon increased their revenue from $43.3 million in the second quarter of 2009 to 644.7 million in the first quarter of 2011, expanding from five North American local markets as of June 30, 2009 to 175 North American local markets and 43 countries as of March 31, 2011. As marketers witnessed the remarkable success of Groupon Inc., they began launching similar social commerce models (e.g., Facebook social commerce platforms) all around the world. Currently, it is reported that there are more than 500 social commerce buying sites worldwide that are based on social networking. One of the underlying reasons for the great success of the social commerce business model is that it stimulates consumers’ desire to purchase unfamiliar goods or services by lowering the marked price and shared opinion with their friends or family about such a product. Multiple studies found that providing special discounts and reviewing others’ opinions toward the service lead to the reduction of transaction costs. According to the Com Score report (State of the U.S. Online Retail Economy in Q1 2010), 23% of Twitter users follow businesses to find special deals, promotions, and sales. Of those users, 14% of Twitter users reported to read and share product reviews and opinions. Bailey’s survey also showed that 25% of consumers, who are connected to brands on Facebook, did so to receive discounts. Recent studies on social commerce investigated how social factors such as social bonding, social interaction, and social support influenced consumer’s usage and social shopping intention [11- 13]. An interesting point, we need to note here, is that little research directly addressed consumer’s decision making process on social commerce website. Extant mainly focused on working mechanisms of the websites (e.g., linking group purchasing via social networking services; setting a marketing mix of price discounts and external environment) or the underlying source of increased popularity. Therefore, the shortcoming of previous studies in the area of social commerce is that they did not empirically address what mechanism stimulate consumer buying in social commerce impulsively. In summary, working mechanism of social commerce is clearly distinguished from traditional group purchasing at some points. Despite much publicity about social commerce, it is still a new phenomenon and has not been studied extensively. Most of all, although it had generally been accepted that social commerce decreased the barrier that consumers feel toward new stores and new services through huge price discount , it is not clearly understood how the features of social commerce really persuade consumers to make purchase impulsively. Therefore, our research will focus on the cause of impulse buying behavior in social commerce and its marginal impact change. For the last 60 years, impulse buying has been one of the most interesting topics that has been studied by many researchers. In particular, consumer researchers have been trying to form a better definition of impulsive buying. In the early days of this research, there was no conceptual difference between unplanned behavior and impulse buying. Researchers, who recognized that impulse buying behavior and unplanned behavior were the same behavior, defined this behavior as “purchasing a product or service without a buying plan.” Then,  pointed out that unplanned purchasing and impulse buying should be distinguished conceptually, as consumers could be willing to spend a considerable amount of time on their buying decision in a store despite no advance buying plan. This case represents not impulse buying but rather unplanned purchasing. They argued further that, if a consumer’s decision time for a specific product is less than the normal decision time for similar products, it is more likely to be impulsive buying behavior. In the same vein,  stated “impulsive buying decisions are unplanned in the sense of thoughtless, but not all unplanned purchases are impulsively decided and unplanned purchase may be made rationally”. In the middle of the 80s, impulse buying was redefined as the behavior "when a consumer experiences a sudden, often powerful and persistent urge to buying something immediately. Impulse to buy is hedonically complex and may stimulate emotional conflict. Also, impulse buying is prone to occur with diminished regard for its consequences". Before , it had been believed that there was a significant difference between impulsive consumers and non-impulsive consumers, which can be described by traits of consumers. Research had focused on finding those traits of consumers. However, after , studies began paying attention to theoretically forming a process describing the relationship between emotional conflict driven by external stimuli and internal intent to purchase impulsively. Recently, the definition of impulse buying has widely been accepted as “the purchase is unplanned, and the desire to purchase is stirred by an unexpected encounter with a stimulus” . First, with respect to external factors, stimuli offered by online shops turned out to be important antecedents of online impulse buying. For instance, price, product images and online advertisement that are perceived as attractive can stimulate an urge to purchase impulsively [19,20] also argued that the existence of unique technical features in online systems can increase the occurrence of impulse buying. They empirically showed that recommendation agents positively affected impulse buying intention, mediated by product search effectiveness. Additionally,  showed that a compelling and sociable virtual experience through usage of interactive and vivid website features as conceptualized with telepresence and social presence had a significant effect on buying impulses over and above traditional marketing and product stimuli. Second, with respect to consumers’ internal factors, researchers found that both consumers’ cognitive and affective state are important antecedents of online buying impulses [22-24]. Empirically  showed that not only a positive affect toward online shopping but also the personality (e.g., impulse buying tendency and shopping enjoyment tendency) influences an urge to buy impulsively. The contribution of this research is that, although impulse buying was usually described as a reaction mediated by hedonic unreflective and irrational mood, it is not free from cognitive processing. In this context  argued that perceived behavioral control was a key antecedent of impulse buying. suggested that self-regulatory resource availability was an important element in determining when and why people engage in impulsive spending. also explored a more cognitive process that might lead people to purchase impulse items, rather than examine the more emotional antecedents. They showed that mental accounting plays a role in diminishing people’s sensitivity to additional purchases as well as the provision of a specific reason to impulse purchases. In summary, while the body of knowledge on the cause and effect of online impulse buying is constantly growing, key factors associated to shopping environment and consumer’s cognitive and affect state are known to us in impulse buying context. However, to the best of our knowledge, study on how such an impulse buying intention changes has never been conducted so far in this field although understanding on marginal impact of such key factors are essential. People react to environmental influences in either a positive (approach behavior) or a negative (avoidance behavior) way. This emotional attitude serves as a mediating or intervening variable in the sequence of the impulse buying process. However, even though impulse buying is usually described as a response triggered by a positive emotional attitude, it is not free from cognitive processing. As mentioned in review of impulse buying literature, not only the positive or negative emotional attitude is referred to as key factors driving impulse buying but also other individual’s cognitive factors. These cognitive factors were also frequently used to predict consumer decision making in consumer behavior studies. The Theory of Planned Behavior (TPB) provides a comprehensive integration of the affective and cognitive components into a structure that is designed to lean to both better explanation and better prediction of consumer behavior. TPB, which has been suggested by , states that the most important determinants of a person’s behavior are their behavioral intent and that this is affected by three main explanatory variables: “attitude toward an act”, “subjective norm”, and “perceived behavioral control”. First, “attitude toward an act” is defined as the individual’s positive or negative feeling about performing a certain behavior. It is determined through an assessment of one’s beliefs regarding the consequences arising from the behavior and an evaluation of the desirability of these consequences. Second, “subjective norm” is defined as an individual's perception or opinion about what important people might believe about what the individual should do in a specific situation. In other words, the meaning of subjective norm is based on the belief that the perceived social pressure about a target behavior comes from the view of people, who are important to the person performing the target behavior. Third, “perceived behavioral control” is defined as one’s perception of the difficulty of performing a behavior. This means one’s judgment of its own capabilities to succeed in performing the target behavior affects the behavior inten  found that people have a tendency not to modify something, if they consider it difficult to do so. TPB has frequently been applied in the context of information technology adoption, to determine the factors affecting a consumer’s usage decisions. Based on TPB, the typical examples of empirical studies that cover ICT consumer behavior are as follows: adoption of the Internet , adoption of mobile services [31,32], use of online services [33-36], adoption of e-commerce [37,38]. In this study, we consider ‘consumer attitude’, ‘subjective norm’, and ‘perceived behavioral controls’ as consumer’s cognitive and affective factors influencing the urge to buy impulsively. Thus, we will address how an increase of positive attitude, subjective norm, and perceived behavioral control influences the change of impulse buying intention. In this study, guided by TPB, we take not only “attitude toward an act” as affective state of consumers but also “subjective norm” and “perceived behavioral control” as the internal cognitive state that makes consumers engage in impulse buying activities in social commerce. The urge to buy impulsively is used to measure the impulse buying intention. Previous studies proved that there is a positive relationship between the urge to buy and the impulse buying intention. This intention was well-fitted to predict the actual impulse buying behavior. Finally, the response is a result of the individual’s decision unleashed by external stimuli related to social commerce characteristics and consumer’s cognitive and affective state. Based on the TPB, we construct a theoretical framework that links between external stimuli as social commerce characteristics, internal state including consumer’s attitude, subjective norm and perceived behavioral control and response as impulse buying intention in the social commerce context (Figure 1). Figure 1: Proposed theoretical research framework. As indicated in Figure 1, our proposed theoretical model based on the TPB framework and extended it, in which each of the independent variables and the response variable are integrated. Price, product, and promotion stimuli influence the consumer’s attitude about buying behavior in social commerce as social commerce characteristics. For example, consumers exposed to huge price cuts are more likely to have a positive attitude toward buying products or services through a social commerce website. In addition to this, other marketing stimuli could also directly influence impulse buying intention . The reason why we selected three factors (i.e., price, product promotion, and place) out of four marketing mix factors is because the fourth factor (i.e., store or physical place) does not exist in social commerce shopping. Furthermore, providing novel products or service at huge discounted prices is the important factor in social commerce. Additionally, we used a single item to measure promotion stimuli by asking how consumers feel about advertising activity of social commerce companies. The fevered pace, at which social commerce companies in Korea were expanding and spending to promote themselves, led to concerns by industry experts regarding the excess competition and unprofitable business due to too much money being spent on advertising . So, in order to capture the effect whether heavy advertising lead to a practically positive attitude, we measured the promotion variable by only focusing on the advertising activity. Regarding the customer’s internal decision making factors, the positive or negative attitude toward purchasing in social commerce is affected by external stimulus. And consumers’ behavioral intentions can also be predicted with high accuracy not only by the attitude toward an act but also by two other cognitive factors: subjective norm, and perceived behavioral control. Studies based on similar research framework have been suggested and developed for so long. Despite valuable effort of prior works, all previous research assumed that the relationship is linear and impact is constant. This assumption has been made, even though there was evidence about a nonlinear linkage between external stimuli and behavior. For instance, studies in the marketing literature have reported nonlinear utility functions [41,42]. In psychology literature, a study on risky decisions has empirically proved the existence of nonlinear consumer response functions . Thus, based on our theoretical framework, we will estimate the suggested model without any parametric assumption. In particular, we will show how impulse buying intention changes with respect to a change in the environmentconsumer interaction. Data was collected through a structured survey questionnaire. Some variables present in our research framework were measured through composite scales. This composite scale approach allows us to gauge psychological variables that otherwise could not be directly quantified. Particularly, a Likert-scale of five points was used to measure the answer. The Likert-scale value of 1 indicates that the respondent completely disagrees with the statement, and the Likert-scale value 5 indicates that the respondent completely agrees with the statement. The questions used for identifying impulse buying intention in social commerce are based on questions of previous studies . The instruments of the questionnaire from the works of  and  were used to measure price, product, and promotion stimuli in social commerce (Table 1). Every variable was measured as perceived level in consumer’s perspective. All variables achieved Cronbach’s alpha values greater than 0.6. Further, in order to measure the attitude, subjective norm, and perceived behavioral control associated with buying through social commerce, instruments were taken from existing studies carried out by [13,15,33]. Every instrument has been re-examined in the context of social commerce shopping. I felt that products or services in social commerce are very economical. I felt that products or services in social commerce give high performance in cost-effectiveness. I felt that the product design in social commerce is very outstanding, making me enjoying shopping. I felt that products in social commerce are highly trendy and newest. Promo PROMO I felt that Social commerce sites heavily advertise their company over TV or Internet n.a. I felt interested to buy products or services through social commerce. I felt enthusiastic during social commerce shopping. I absolutely believed that my family would favor my purchasing over social commerce. I absolutely believed that my colleagues would favor my purchasing over social commerce. I have enough knowledge and ability to buy products through social commerce. Browsing social commerce websites, I have the desire to buy items that did not pertain to my specific shopping list. While browsing social commerce websites, I feel the inclination to purchase items outside my specific shopping list. The survey was conducted through a Web-based survey system provided by EZ Survey, which is a firm specialized in online consumer surveys. The company maintains millions of potential survey participants. For the survey portion of this research, a sample from the EZ survey panel was asked to participate. Respondents were offered a small amount of electronic cash as payment for participating in the survey. Respondents, who had previous experience in buying products or services impulsively in social commerce, were targeted. Finally, out of 524 samples returned by respondents, we secured 500 samples that do not miss any data. Besides, before the main survey was executed, two preliminarily pilot tests (with 20 graduate students) were conducted to check the clarity of questionnaire instruments. One of the main purposes of this study is to explore the marginal impact change of marketing stimuli-customer interaction on impulse buying intention. Therefore, we adopt a nonparametric function estimation method, namely the MARS method in current study, which has been developed by Friedman . It finds nonlinear flexible functions without any functional assumptions by using smoothing splines to fit the relationship between a set of predictors and a response variable. It allows capturing “shifts” in the relationship between independent variables by requiring only curve segments to be continuous [48,49]. These shifts occur at locations called “knots”. The modelling procedure of MARS is inspired by the recursive partitioning technique (RPT) that governs classification trees, regression trees, and generalized additive modelling. RPT is an adaptive algorithm for function approximation with the capability of handling a large number of explanatory variables . Where N denotes the number of observations, C(M) is the cost penalty measure of a model containing M basis function, Yi is the dependent variable, and χi is independent variable set. The numerator measures the lack of fit on the M basis function model fM (xi) and denominator denotes the penalty for model complexity C(M). Finally, the MARS method generates a continuous regression model with continuous derivatives and has the capability and flexibility to model relationships that are additive or have interactions [51,52]. By allowing for any arbitrary shape of the functions to capture any kind of interaction, and by using the above-mentioned two-stage model testing procedure, MARS can reveal very complex data structure that are often hidden in highdimensional data . Therefore, the MARS model highly suits our objectives of finding the significant variables that influence impulse buying intention, as well as finding how they affect the response variable marginally. The total number of respondents, as shown in Table 2, consists of 250 males (50%) and 250 females (50%). The equal number of respondents in each gender (male/female) group was assigned. The same is true for the age groups. Collecting the same number of consumers with respect to age is acceptable from the point that this study is not intended for a difference analysis according to demographic characteristics but for extracting the general behavior functions of consumers to stimuli. The average household income of respondents was 3,352 KWon1. Regarding the education level, majority of respondents were college graduates (49.6%) or college students (15.8%). Respondents, who have a master or doctoral degree, accounted for 7%. Table 3 presents the descriptive statistics and correlation coefficients of the independent variables and the response variable. The mean of all variables is between 3.04 and 3.68 and the standard deviation is between 0.548 and 0.804 (Table 3). It is notable that both the mean and variance of price stimulus is higher than those of product and promotion stimuli. This fact implies that peoples’ impulsive buying intention can be heavily affected by the perceived level of price discount. The empirical models consist of two different regressions. One of them is for analyzing the effect of marketing mix on the attitude of consumers toward buying through social commerce. Table 4 shows the estimated knot configuration and their spline coefficients of the first regression. The response variable is consumer attitude toward making a purchase in social commerce R2. Overall, the first regression model is significant (adjusted =0.2063, F=26.93, and p < 0.001). The estimated result of the knot configurations and their coefficients shows that the intercept term, three main effects terms, and one two-way interaction term were found to be statistically significant. There is a couple of interesting regression results. First, we found that the product (max(0,2.333-PROD), β=-1.1482) and price (max(0,PRICE-2.667), β 0.3097) stimuli have a significant impact on consumer attitude toward buying in social commerce while promotion is statistically insignificant. The estimation result corresponds to the fact that active price and product stimuli accelerated constructing positive attitudes toward purchasing in social commerce in Korea. Additionally, the fact that we found two knots in two basis functions, one with respect to product and another one with respect to price shows that the impact of price stimuli and product stimuli is not linear but nonlinear, which implies that perceived price discount has a discontinuous impact on consumer attitude changes. A linear regression model would not find such a discontinuity. Second, it is of particular interest that the interaction between product and price (max(0,PROD-4)*max(0, PRICE-2.667), β=0.6837) are estimated to be significant. This means that the impact of price and product stimuli is not independent when they form a consumer’s attitude toward social commerce. Further, it implies that an optimal configuration between levels of product and price stimuli may exist that maximizes the consumer’s positive attitude toward using a social commerce website. Third, fact that the main effect of promotion was not observed indicates that promotion does not directly influence the attitude of consumers. However, the interaction effect between promotion and product (max(0,3.333-PROD)*max(0,2.667-PROMO), β=- 0.5154) is statistically significant. This implies that the promotion stimuli influence attitude toward buying in social commerce by enhancing the relationship between product stimuli and attitude. To test the structural relationship between external marketing stimuli, consumer’s cognitive and affective factors and impulse buying intention, the second regression model using MARS was estimated. The results are reported and depicted in Table 5. Table 5 shows the estimated results of the knot configurations and their spline coefficients of the second regression model. As with the first regression model, the second regression model is also significant in the overall model fit (adjusted =0.3645, F=23.02, and p < 0.001), confirming the key role of price stimuli as an external stimuli. The relationship between an individual’s affective and cognitive state and impulse buying is also supported. Some interesting results in the second regression model are notable and can be summarized as follows. First of all, out of the three marketing stimulus variables, we found that only the price stimulus is significant (max(0, PRICE-2.667), β=-0.4049; max(0, 2.667-PRICE), β=-1.0771) in increasing the impulse buying intention. The product and promotion stimuli do not directly influence the impulse buying intention. It is reasonable to infer that, among the distinct characteristics of social commerce, providing huge discounted prices (e.g., sometimes up to a 90% discount) is effective in attracting impulse buying intentions of consumers. Second, but more surprisingly, a knot configuration (knot of price 2.667) with respect to price was obtained. The fact that the knot was obtained in the MARS estimation proves that the regression model supports the notion that the consumer’s response function with respect to price stimuli is discontinuous. It shows that its impact drastically changes at 2.667 (max(0, 2.667-PRICE)). Moreover, a change in the impulse buying intention with respect to the consumer’s cognitive and affective state is also discontinuous, as a knot was obtained with respect to the “attitude toward an act” variable, the “subjective norm” variable, and the “perceived behavioral control” variable. We found that the urge to buy impulsively increases as the level of subjective norm decreases, whereas the urge to buy impulsively is positively affected by an increase of attitude and perceived behavioral control. One potential interpretation of this result is that consumers are more likely to purchase impulsively, if they are not concerned about what other people think of their purchasing behavior in social commerce. Third, the model estimated not only the main effect but also the interaction effects between the independent variables. For instance, the interaction effect between price and attitude (max(0, AT-2) * max(0, PRICE-2.667), β=-0.2744) is found to be statistically significant. This result indicates that the relationship between price stimulus and impulse buying is moderated by an individual’s attitude towards buying over social commerce. Furthermore, the knot and coefficients show that the effect of price stimulus on impulse buying is strengthened, if consumers have a positive attitude about purchasing in social commerce. Lastly, the fact that the estimation results found multiple significant interaction effects between the independent variables implies that there may be an optimal combination that maximizes the impulse buying intention in social commerce. Considering MARS estimation results of knot configuration and spline coefficients, which include a set of multiple independent variables and their interactions, it is not easy to interpret and show how the significant antecedent variables influence the change of impulse buying intention marginally. In particular, it is difficult to predict how a sole marketing mix variable or consumer’s internal decision making factors influences a consumer’s intention to impulse buying because interaction effects between them exist. In this situation, Monte Carlo methods can be used to solve any problem having a probabilistic interpretation. By the law of large numbers, integrals described by the expected value of some random variable can be approximated by taking the empirical mean of independent samples of the variable. Therefore, the objective of this simulation presented in this section is to trace the change of the dependent variables with respect to the significant independent variables and eventually find the optimal level of marketing mix that maximizes the intention to make impulse purchases by applying Monte Carlo method. Step 1. Since each variable was measured on a 5-point Likert scale, we divide each scale into 500 discrete points to be able to capture small effects. Therefore, we generate 500 points from 0.01 to 5.00 for each variable of interest, and these points are listed in numerical order. For example, because we are interested in capturing the effect of the price stimulus on impulse buying intention, we generate 500 points for the price stimulus. Step 2. Values of other variables that are not of interest are randomly generated using a uniform distribution in the range from 0 to 5. In this case, 10,000 values are randomly generated. Step 3. Therefore, for one discrete point, 10,000 simulations of the estimated model are run. Then, the 10,000 results for each point of the main variable are averaged. The average is the controlled effect of other variables not being of interest. Step 4. Repeat the procedure of Step 2 and Step 3 with the next value of the 500 value that had been generated in Step 1 until all 500 points have been processed. By following this procedure, it becomes observable how a change in the perceived price stimulus affects the impulse buying intention (Figure 2). Figure 2: Marginal response function of price stimulus on impulse buying intention. In detail, Figure 2 shows that perceived price stimulus affects the consumer’s impulse buying intention linearly to the point where the stimulus reaches 2.667, and then its impact decreases. This result implies two interesting points. First, we can infer that the effect of a perceived price stimulus with respect to impulse buying intention shows a maximum. This is linked to the estimation of the value function in psychology literature. Several studies of value functions indicated that nonlinear value functions would typically provide a better fit for both risky and non-risky decisions. Following this line of argument, the nonlinear relationship between a perceived price stimulus and a consumer’s impulse buying decision can also be explained. Second, we see that a price stimulus follows the “law of diminishing return” in terms of impulse buying intention, which implies that bigger stimulus does not always lead to increase in impulse buying intention. 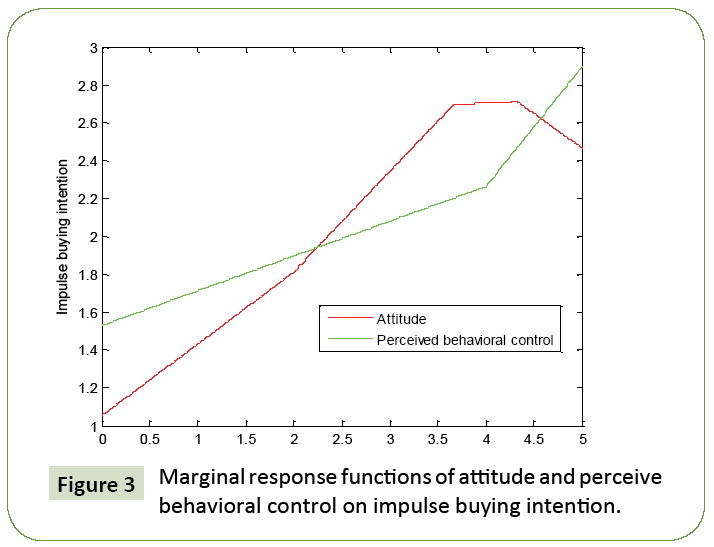 Figure 3 graphically represents how consumers’ attitude and perceived behavioral control influence the impulse buying intention in social commerce. With respect to attitude, we found that the effect of a positive attitude about buying over social commerce site on impulse buying intention peaks at around 4.333 and decreases gradually afterwards. This tells us that a more positive attitude is not always linked to impulse buying though a positive attitude is needed to trigger an urge to purchase impulsively. This can be interpreted as the effect of a positive attitude on a change of impulse buying intention. It also follows the law of diminishing returns, as we also saw in the case of the price stimulus effect. Figure 3: Marginal response functions of attitude and perceive behavioral control on impulse buying intention. On the contrary, it is shown that the effect of perceived behavioral control on impulse buying increases as its level increases. It is notable that it expeditiously rises beyond 4 points on the Likertscale. That means that, the more consumers believe that they have adequate capability (i.e., budget, time, and knowledge) to make a purchase, the more they are attracted to impulse buying in social commerce. Consequently, the result implies that, with more resources (i.e., budget, time, and knowledge) for accessing social commerce sites, consumers are more likely to follow their impulse buying in social commerce. In this context, providing a huge price discount is an efficient strategy because increases consumer’s willingness to buy and eventually lowers the perceived behavioral control. Our tests provided three important results: (1) a conceptual understanding of the impulse buying process in social commerce, (2) identification of the determinants of a significant marketing mix and the consumer’s internal decision making factors to stimulate the urge to buy impulsively, (3) understanding on marginal response function of impulse buying intention with respect to external stimuli and consumer interaction. Given that previous studies have only suggested examining the role of price discounts and time pressure for understanding the impulse buying behavior of consumers, the main contribution of our study is that this addressed the significant determinants in impulse buying in the context of social commerce as well as how these significant variables nonlinearly influence the impulse buying intention. The analysis results advances the understanding of consumer impulse purchasing behavior in the social commerce context. Furthermore, to the best of our knowledge, none of previous consumer research in e-commerce area showed change of marginal impact and the corresponding nonlinear change of consumer intent (despite the fact that there is empirical evidence on the nonlinear response of consumer attitudes). Therefore, we can state that this is the first study, which examines the change of marginal impact of external stimuli and customer’s cognitive and affective factors on the urge to buy impulsively. The study presented is meaningful as this shows how consumers response in social commerce. Based on findings of our test, we can draw several key implications from a theoretical and managerial perspective. From a theoretical perspective, the first contribution of this study is the identification of an unknown structural relationship between external stimulus, the consumers’ affective and cognitive state, and the impulse buying intention. In detail, we found that, although price and product stimulus were effective, promotions were not a directly significant marketing strategy to make consumers feel positive about social commerce. Our result complements prior research’s findings  explained that the product and price stimuli are fundamental components of the consumer decision making process in social shopping community. Furthermore, they empirically found that the direct shopping filter mechanism of price correlates positively with a consumer’s click-out. Our finding shows that price discounts are meaningful not only for click-out situations but also in the impulse buying context. In summary, in terms of price cut and the uniqueness of products or services offered, they were a very effective approach to consumers, which eventually gives consumers a positive attitude toward social commerce. The second more important contribution of this research is that we addressed the functional relationship between impulse buying behavior and customer-environment interaction without any parametric assumption and empirically show change of marginal impact. Although a lot of researches have been conducted so far in the consumer behavior area by applying the TPB theoretically, they have not critically questioned how the impact of each significant factor in the model varied as the level of its variable increases. Thus, we tried to uncover the impact of external stimuli and an individual’s internal cognitive and affective factors, using a nonparametric regression method. We eventually showed that the relationship is not linear but nonlinear. Specifically, the results revealed that the effect of price discount presents a diminishing pattern. The impact of positive attitude toward buying in social commerce on impulse buying intention shows a peak point at 3.5 of 5 points on the Likert scale. We additionally found that an increase in the perceived behavioral control resulted in a drastically increase of impulse buying intention. Therefore, it can be stated that there is optimal level of perceived price discount in social commerce that maximize positive attitude and impulse purchasing intention. From a managerial perspective, our results imply that social commerce strategies, which focus on big price discounts and product differentiation, may help increasing consumer’s positive attitude toward buying on social commerce, which, in turn, could influence impulse buying behavior. We also found that the promotion stimulus is not a direct significant marketing strategy, whereas product and price stimuli are. This knowledge is essential for the social commerce market. For example, in Korea, there were more than 100 social commerce enterprises in 2011. In 2015, however, only 3 major social commerce sites remained, since competition in the social commerce in Korea had escalated. On top of an advertising war, competition grew to the point where several sites began selling coupons while knowingly taking a loss. The loss came from spending budget on advertisement. Many social commerce enterprises deteriorated rapidly by spending much of the budget on promotions , which we found to be an insignificant factor in our study. Instead, without heavy promotions, providing novel products or services at discount prices can be successful strategy. Another implication of our research comes from the discontinuous response of consumer behavior, in particular, the diminishing pattern with respect to price discount and the increasing return to scale with respect to perceived behavioral control. Marketers need to note that perceived price discount is only effective up to a certain point. In our simulation, the effectiveness reached a peak at 2.7 of the 5 point Likert scale. Any further stimuli do not guarantee a positive attitude of consumers towards impulse buying. Rather, marketers have to focus on how to enhance perceived behavioral control of consumer in social commerce. A high level of perceived behavioral control is more likely to increase the impulse buying. For example, providing essential goods and service at discounted prices, rather than precious luxurious goods or services, could be more useful to attract consumers, and this makes consumers think that they are willing to buy them within their own budget or income. In other words, although discount rate of expensive luxurious goods is high, price of such goods are more likely to out of consumer’s monthly budget. So it is not easy to attract consumers with them since they are out of control in terms of budget. Additionally, providing guidelines on how to enjoy social commerce to consumers, who have not experienced social commerce buying yet, could be also effective for increasing the knowledge part of perceived behavioral control. This research has a few limitations. In this research, we used survey data, in order to address consumer’s impulse buying. Although the conceptual definition of impulse buying and unplanned purchase is clearly distinguishable academically, it is unclear to define a boundary between impulse buying and unplanned buying or normal buying in real world purchase occasion. This study verifies that consumers with high positive attitude and perceived behavioral control are more likely to feel an urge to buy impulsively in social commerce. However, under this setting, it is difficult to classify impulsive purchases and nonimpulsive purchases rigidly. This study only can observe the effect of variables on consumer’s intention. It is one of the limitations in many existing impulsive buying studies, and this study also is not free of the problem. To observe the impulse buying correctly, we believe that experiments with consumers could give more realistic results. Another limitation is that we used a “perceived level” of marketing mix to measure external stimuli. Thus, we are not able to suggest an objective level of marketing mix in social commerce strategically. For example, even if the same price discount is given to two different consumers, the perceived level of price cut stimulus to those buyers could be different. What we found in this study is how the perceived level of price stimulus positively impacts the consumer’s attitude and impulse buying intention in social commerce. Thus, it is limited to provide strategic guidelines regarding price discount policies. We expect that further research addresses this limitation by using revealed preference market data. Since revealed preference data includes objective price and promotion information on the market, it can provide strategic information regarding price discounts and promotion policies. Despite these limitations, the results of this study can be helpful to later studies and marketers. Most of all, we found that price stimulus had a diminishing effect on impulse buying intentions. Impact of attitude and perceived behavioral control on impulse buying intentions also drastically change as their levels increase. In summary, we have taken the initial steps for analyzing the consumer response in impulse buying behavior in the social commerce context. We hope that this encourages future research on some of the unresolved issues raised here. 1Won is the currency of South Korea 1100 Won is approximately $1. Dennison G, Bourdage-Braun S, Chetuparambil M (2009) Social commerce defined, White paper 23747. Kim Y, Srivastava J (2007) Impact of social influence in e-commerce decision making, in: Proceedings of the ninth international conference on Electronic commerce, (ACM) pp: 293-302. Huang Z, Benyoucef M (2013) From e-commerce to social commerce: A close look at design features, Electronic Commerce Research and Applications 12: 246-259. Turban E, Bolloju N, Liang TP (2010) Social commerce: An e-commerce perspective, in: Proceedings of the 12th International Conference on Electronic Commerce: Roadmap for the Future of Electronic Business, (ACM, pp: 33-42. Kim S, Park H (2013) Effects of various characteristics of social commerce (s-commerce) on consumers’ trust and trust performance, International Journal of Information Management 33: 318-332. Mehrabian A, Russell JA (1974) An approach to environmental psychology, (the MIT Press). Chen JV, Su Bc, Widjaja AE (2016) Facebook C2C social commerce: A study of online impulse buying, Decision Support Systems 83: 57-69. Liu Y, Li H, Hu F (2013) Website attributes in urging online impulse purchase: An empirical investigation on consumer perceptions, Decision Support Systems 55: 829-837. Kalyanaram G, Winer RS (1995) Empirical Generalizations from Reference Price Research, Marketing Science 14: G161-G169. Gupta S, Cooper LG (1992) The discounting of discounts and promotion thresholds, J cons res 19: 401. Amblee N, Bui T (2011) Harnessing the Influence of Social Proof in Online Shopping: The Effect of Electronic Word of Mouth on Sales of Digital Microproducts, Inter J Elec Comm 16: 91-114. Liang Tp, Turban E (2011) Introduction to the Special Issue Social Commerce: A Research Framework for Social Commerce, International Journal of Electronic Commerce 16: 5-14. Pagani M, Mirabello A (2011) The Influence of Personal and Social-Interactive Engagement in Social TV Web Sites, International Journal of Electronic Commerce 16: 41-68. Hughes S, Beukes C (2012) Growth and implications of social e-commerce and group buying daily deal sites: the case of groupon and livingsocial, Int Bus & Econ Res J (IBER) 11: 921-934. D'Antoni Jr JS, Shenson HL (1973) Impulse Buying Revisited: A Behavioral Typology, J of Retail 49: 63. Weinberg P, Gottwald G (1982) Impulsive consumer buying as a result of emotions, J Busi Res 10: 43-57. Rookh DW (1987) The buying impulse, The Journal of Consumer Research 14: 189-199. Piron F(1991) Defining Impulse Purchasing, Advances in Consumer Research 18: 509-514. Madhavaram SR, Laverie DA (2004) Exploring impulse purchasing on the internet, Advances in Consumer Research 31: 59-66. Hostler RE, Yoon VY, Guo Z, Guimaraes T, Forgionne G (2011) Assessing the impact of recommender agents on on-line consumer unplanned purchase behavior, Information & Management 48: 336-343. Ning Shen K, Khalifa M (2012) System design effects on online impulse buying, Internet Research 22: 396-425. Adelaar T, Chang S, Lancendorfer KM, Lee B, Morimoto M (2003) Effects of media formats on emotions and impulse buying intent J Infor. Tech 18: 247-266. Koufaris M (2002) Applying the technology acceptance model and flow theory to online consumer behavior, Information systems research 13: 205-223. Parboteeah DV, Valacich JS, Wells JD (2009) The influence of website characteristics on a consumer's urge to buy impulsively, Information Systems Research 20: 60-78. Mohan G, Sivakumaran B, Sharma P (2013) Impact of store environment on impulse buying behavior, European Journal of Marketing, 47: 1711-1732. Vohs KD, Faber RJ (2007) Spent Resources: Self-Regulatory Resource Availability Affects Impulse Buying. Jeffrey SA, Hodge R (2007) Factors influencing impulse buying during an online purchase, Elect Comm Res, 7: 367-379. Ajzen I (1991) The theory of planned behavior, Organizational behavior and human decision processes, 50: 179-211. Bandura A (1997) Self-efficacy: The exercise of control, (Macmillan). Klobas JE, Clyde LA (2000) Adults Learning to Use the Internet: A Longitudinal Study of Attitudes and Other Factors Associated with Intended Internet Use, Library & Information Science Research 22: 5-34. Pedersen PE, Nysveen H (2003) Usefulness and self-expressiveness: extending TAM to explain the adoption of a mobile parking service, in: 16th Electronic Commerce Conference, Bled, Slovenia, June pp: 9-11. Wang YS, Lin HH, Luarn P (2006) Predicting consumer intention to use mobile service, Infor Sys J 16: 157-179. Bosnjak M, Obermeier D, Tuten TL (2006) Predicting and explaining the propensity to bid in online auctions: a comparison of two action-theoretical models, J Cons Behvi 5: 102-116. Hsu MH, Chiu CM (2004) Predicting electronic service continuance with a decomposed theory of planned behaviour, Behaviour & Information Technology 23: 359-373. Lau AS, Yen J, Chau PY (2001) Adoption of On-line Trading in the Hong Kong Financial Market, J. Electron. Commerce Res 2: 58-65. Lee KC, Kang I, Kim JS (2007) Exploring the user interface of negotiation support systems from the user acceptance perspective, Computers in Human Behavior 23: 220-239. Herrero Crespo Á, Rodríguez del Bosque I (2008) The effect of innovativeness on the adoption of B2C e-commerce: A model based on the Theory of Planned Behaviour, Comp Hum Behav 24: 2830-2847. Limayem M, Khalifa M, Frini A (2000) What makes consumers buy from Internet? A longitudinal study of online shopping, Systems, Man and Cybernetics, Part A: Systems and Humans, IEEE Transactions on 30: 421-432. Mattila AS, Wirtz J (2008) The role of store environmental stimulation and social factors on impulse purchasing, Journal of Services Marketing 22: 562-567. Jeon S, Yoo B (2014) Going Local or Global: The Case of Online Daily Deal Company TicketMonster, Asian Case Research Journal 18: 401-428. Abe A (1998) Measuring consumer, nonlinear brand choice response to price, J Retail 74: 541-568. Kim JG, Menzefricke U, Feinberg FM (2007) Capturing flexible heterogeneous utility curves: A Bayesian spline approach, Management Science 53: 340-354. Tversky A, Kahneman D (1992) Advances in prospect theory: Cumulative representation of uncertainty, J Risk Uncertainty 5: 297-323. Gentry L, Calantone R (2002) A comparison of three models to explain shop-bot use on the web, Psychology & Marketing, 19: 945-956. Lokken SL, Cross GW, Halbert LK, Lindsey G, Derby C, et al. (2003)Comparing online and non-online shoppers, International Journal of Consumer Studies 27: 126-133. Page-Thomas K, Moss G, Chelly D, Yabin S (2006) The provision of delivery information online: a missed opportunity, International Journal of Retail & Distribution Management 34: 258-277. Friedman JH (1991) Multivariate adaptive regression splines, The annals of statistics 1-67. Kao LJ, Chiu CC, Lu CJ, Chang CH (2013) A hybrid approach by integrating wavelet-based feature extraction with MARS and SVR for stock index forecasting, Decision Support Systems 54: 1228-1244. Steinberg D, Colla P (1999) MARS: An Introduction, San Diego, CA, USA: Salford Systems. Deichmann J, Eshghi A, Haughton D, Sayek S, Teebagy N (2002) Application of multiple adaptive regression splines (MARS) in direct response modeling, Journal of Interactive Marketing 16: 15-27. Chou SM, Lee TS, Shao YE, Chen IF (2004) Mining the breast cancer pattern using artificial neural networks and multivariate adaptive regression splines, Expert Systems with Applications 27: 133-142. T.-S. Lee, I.F. Chen, A two-stage hybrid credit scoring model using artificial neural networks and multivariate adaptive regression splines, Expert Systems with Applications 28: 743-752. Lu CJ, Lee TS, Lian CM (2012) Sales forecasting for computer wholesalers: A comparison of multivariate adaptive regression splines and artificial neural networks, Decision Support Systems 54: 584-596. Olbrich R, Holsing C (2011) Modeling Consumer Purchasing Behavior in Social Shopping Communities with Clickstream Data, International Journal of Electronic Commerce 16: 15-40.